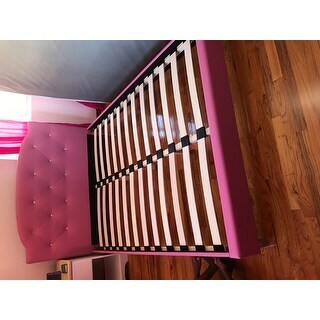 I got this bed frame for my daughter and it is so pretty! Bring contemporary style to your room with this gorgeous Bird bed from Silver Orchid. Made from hardwood and plywood, and upholstered in faux leather upholstery with a pink color, the beautiful bed is designed to be used without the need for a box spring. The camelback headboard features crystal tufting and stitched diamond detailing for a look that complements the upholstered base, and completes the timeless comfort of this lovely bed. We love this bed! Easy to assemble and not box spring needed. My daughter loves it and so do we. Ordered this for my 9 year old and she loves it! It is cool and appears will get good use and be durable for child/teen use and abuse. The platform style is nice since no box springs are required. She can pile up stuffed animals around it with ease! Good value for the money. 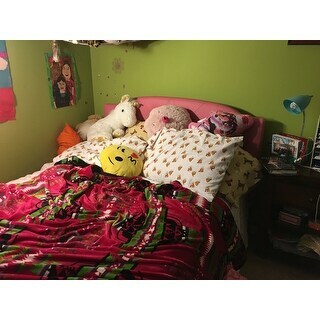 This bed looks great in my daughters room! Bought this for my 8 year old daughter. It's cute but I wish it was a little higher in height off the ground and I'd rather it not have the pink platform edge. Just the pink headboard would've been perfect. Price was awesome though and it fits the need. My daughter loves this bed! This is a beautiful bed frame that is well made, soft and durable. It looks great in our teen daughter's bedroom and we've already received numerous compliments on it. This frame was surprisingly well made and the color was spot on. The only issue we had with it was the slats that hold the mattress. They didn't seem sturdy enough and after a few years of use (kid was 7-9-ish), two of the slats actually snapped. Other than that, the frame has been great and has held up well. My 3 year old was getting her first big girl bed and wanted a "pink and sparkle" bed. I found this and ordered it. The bed arrived quickly and was easy to put together. We are all thrilled with it. Super cute but the we had to reinforce the support pegs. Its great! Easy to put together. Everyone is happy! Beautiful bed. I bought this for my niece when she moved into her new bedroom. She was so excited and absolutely loves it! I put this bed together by myself. Directions extremely easy to follow. "up to what age a kid can use this for and whats the weight limit for someone to lay on the bed?" "Weight limit on this bed?" Unfortunately, information regarding the weight limit is currently unavailable. We apologize for any inconvience. It's for my niece she loves Pink! Color and style seem perfect for my daughter's bedroom. "Will this bed fit a queen sized bed too?" Hello Mrs.Long, this item will not fit a Queen mattress properly. Thank you for shopping with us. "What type of mattress thickness do you recommend?" Hello radiance27, we suggest at least a 9 inches mattress. Please let us know if you have any further questions. "Does this bed require a box spring?" Hello arealambition14, this bed does not require a box spring. Please let us know if you have additional questions. Thanks for shopping with us.